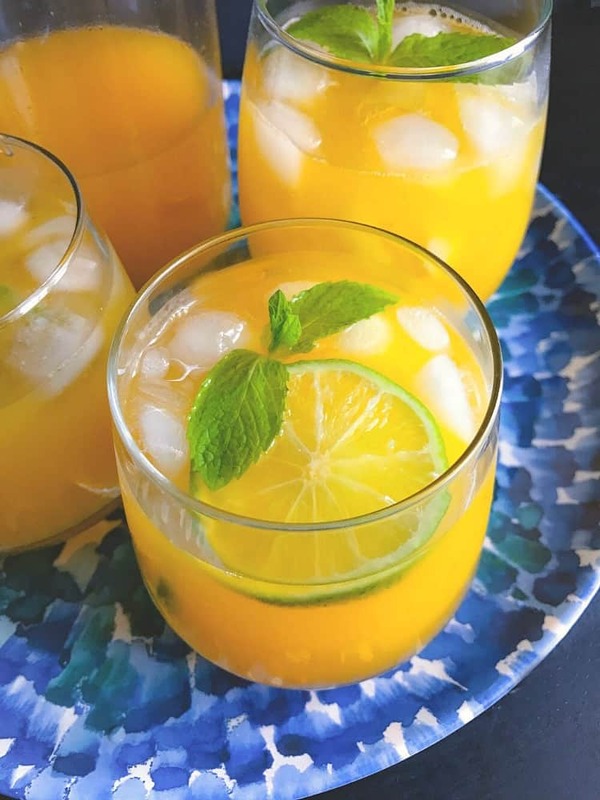 Iced Mango Mint Turmeric Green Tea: an extremely flavorful and easy iced tea recipe that’s not only delicious but good for you too. Easy to make and can be kept in the fridge for upto 2-3 days. I’m waiting for spring-summer to start here in California!! And till then I’m going to keep calm and drink these Iced Mango Mint Turmeric Green Tea. 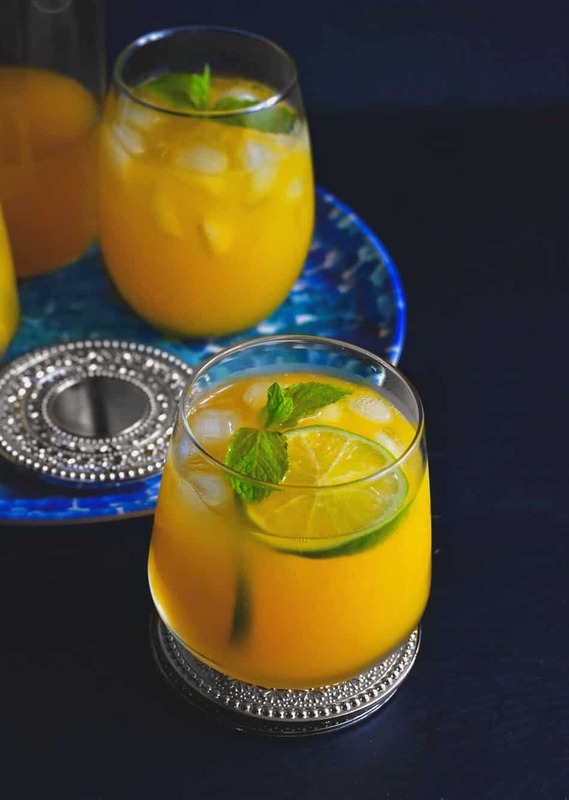 This gorgeous looking iced mango tea is packed with flavors and It’s packed with healing powers. It’s also super easy to make and I usually make a big jar and store in the fridge for 2-3 days. The only thing to keep in mind is that you don’t mix ice with it while storing as it’s going to make it extra watery and slightly less flavorful. Since it’s the beginning of spring (read cold spring with lots of rain n cloud), are local markets and stores are packed with fresh fruits and veggies. And, we also have the ‘king of fruit’ – mangoes (as called in India). So, I’m using fresh mangoes to make this Iced Mango Mint Turmeric Green Tea. However, you can make them with packaged frozen mangoes or store bought mango pulp (available in most Indian stores). Since green teas are my favorite, I decided to use that as a base but you can also use black tea or white tea. The other most important ingredient is fresh mint leaves. 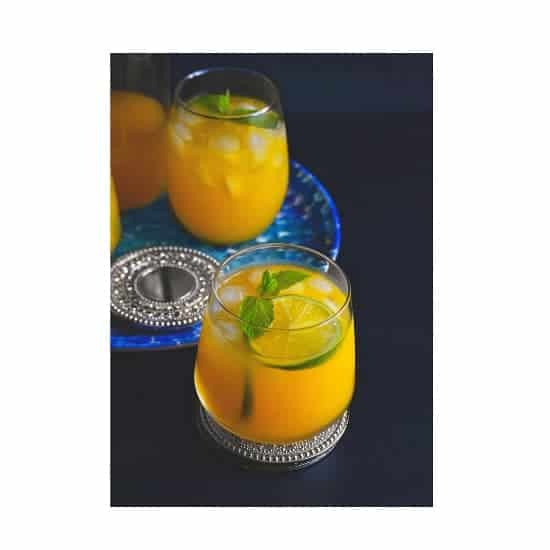 It not only makes this Iced Mango Mint Turmeric Green Tea look beautiful but taste extremely refreshing. Also, adding the turmeric gives it a delicious, colorful and extremely healing twist. As in many Indian households, turmeric is the most used spice ingredient and I love using it in not only cooked recipes but drinks too. 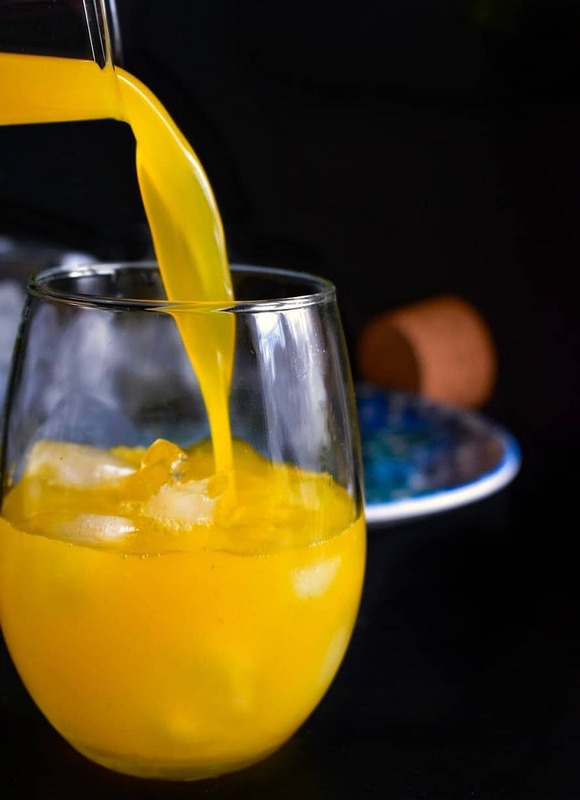 Turmeric adds a beautiful yellow color and makes the drink filled with anti-inflammatory benefits. It also is a great mood booster or stress reliever. Once you have these main ingredients, you just needed water, sugar and some fresh lime juice to start making this delicious iced tea. You need to remember to NOT steep the green tea for longer as then you get a very strong-bitter tea flavor. So what I usually do is just steep the tea for 2-3 minutes and then remove the tea-bags once boiled. 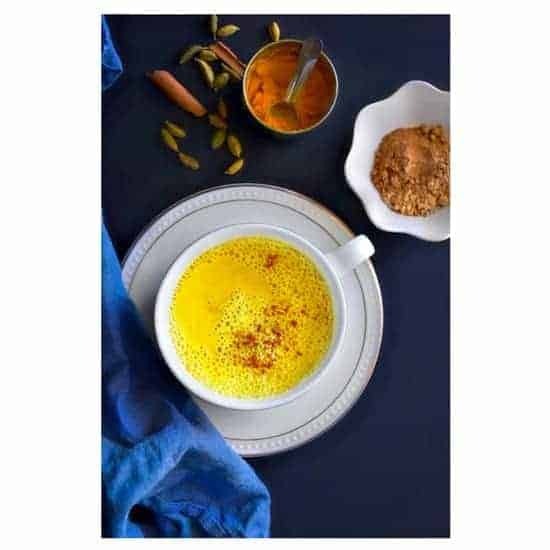 You don’t want to add too much turmeric as uncooked turmeric has a bitter taste if mixed in large quantity. So just use 1/8 or 1/4 Tsp depending on the quantity of water you use. Then mix everything else as per instructions below and the tea is ready in 5 minutes. 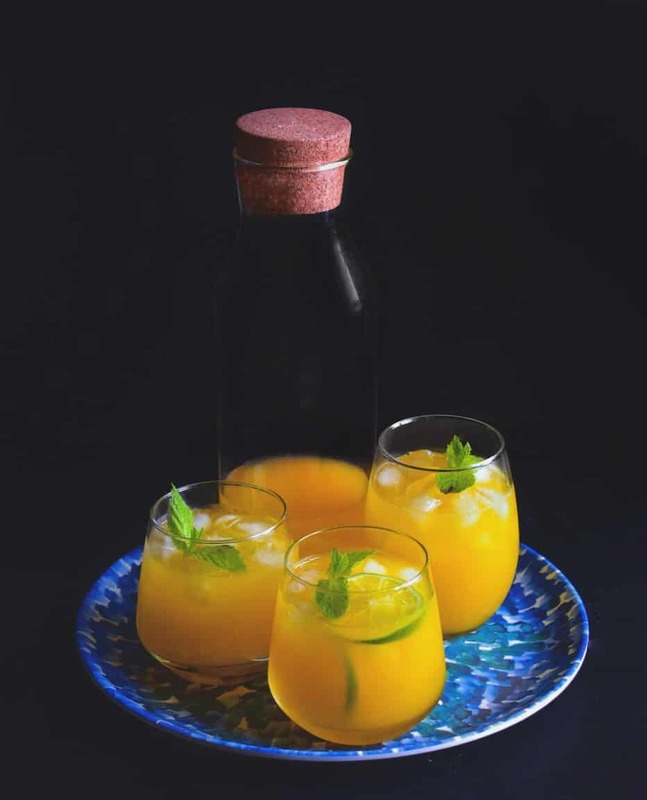 So, I hope you make this Iced Mango Mint Turmeric Green Tea soon and enjoy the healthy-delicious flavors. It also makes for a great drink for Mother’s Day celebration. 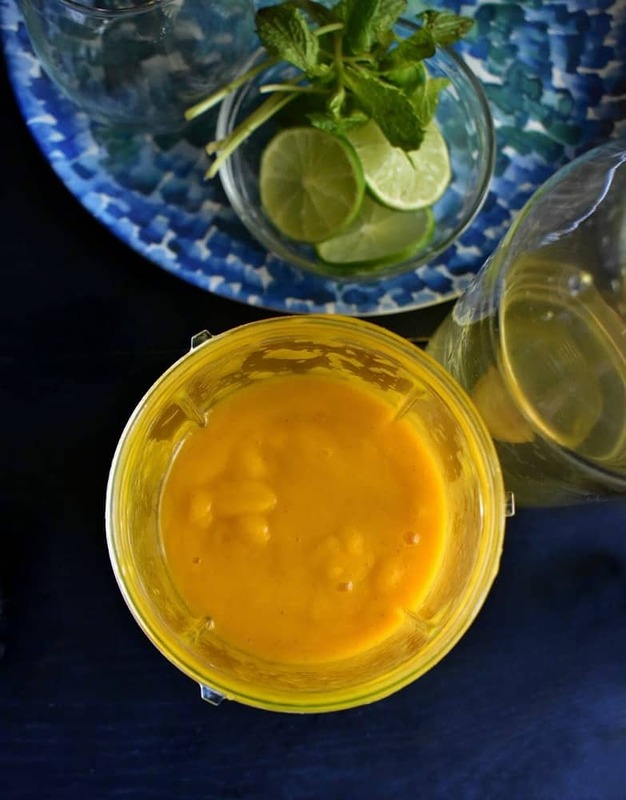 Blend mango cubes in a blender and keep the pulp aside. In a large pot, bring 5 cups water to a boil. Add green tea bags, turmeric and let this simmer for 2 minutes. Turn off the heat and remove the green tea bags (if you want a stronger tea, then let it steep in the hot water). Now add the mango pulp and sugar. Stir using a large spoon or whisk. Add ice, lemon slices and pour the mango green tea in all. 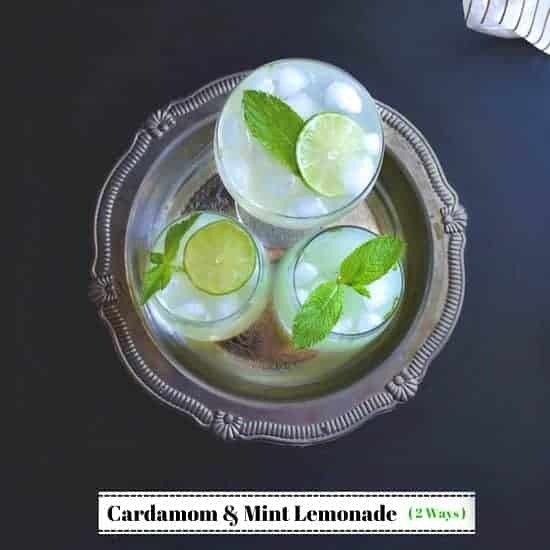 Add the fresh mint sprig in each glass and serve immediately. ** If serving later, then keep the iced mango tea in the fridge and serve accordingly. 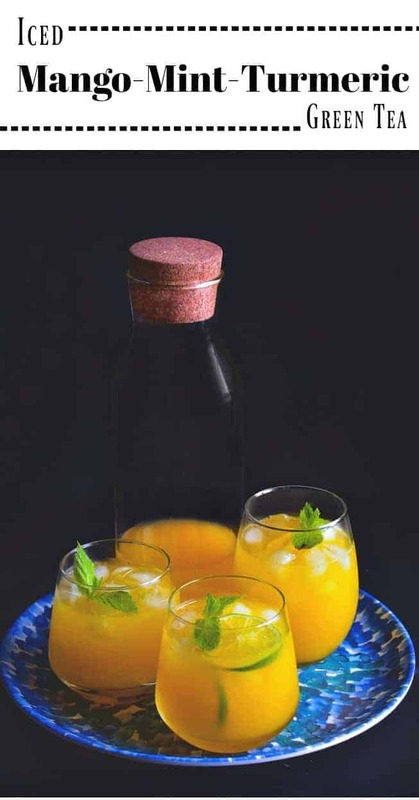 1 Reply to "Iced Mango Mint Turmeric Green Tea"
This looks so beautiful & refreshing !